Scarlett Johansson as the Black Widow. If the Scarlet Witch signs on with the Avengers in “Avengers: Age of Ultron” when it hits theaters this Friday, she’ll be gently nudging the on-screen adaptation of the superhero team toward the relatively diverse team we see in the comic books. 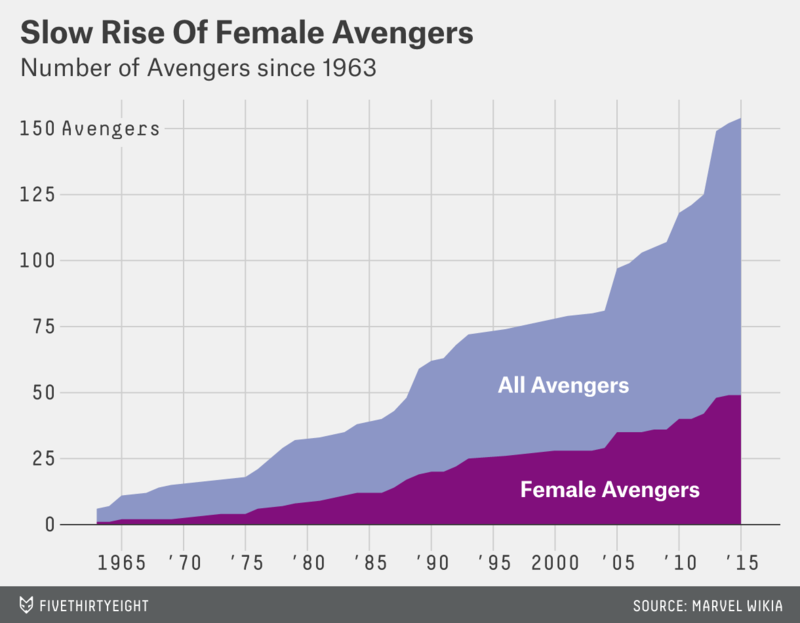 In the first five years of the team’s operation, the Avengers hovered between about 14 percent and 18 percent female, but in its 10th year, the roster of current and former Avengers was about a quarter women. They were ahead of their time! It was 1973 when the Avengers hit the one-fourth mark, a threshold that the entire mainline Marvel comic book universe wouldn’t reach until 2011. While men seriously outnumber women on the Avengers team in the comic books, the on-screen team is way worse. I haven’t seen the movie yet, but let’s say the three newcomers — Scarlet Witch, Quicksilver and the Vision — join up and the team otherwise remains unchanged. That’ll mean that 22 percent of the movie Avengers are women. The last time the comic book Avengers were that heavily male was in 1975. There are definitely opportunities for the movie team to welcome new women. There’s a Jessica Jones Netflix show in the works and a Carol Danvers movie in the pipeline, and while it hasn’t yet operated as a minor league for the Avengers movies, the ABC show “Marvel’s Agents of Shield” could still very well promote one of its female supers to the big leagues. But as I mentioned Tuesday, Marvel, there’s an easy solution here: She-Hulk. She-Hulk totally rules. I pulled data on gender and join date for members of the Avengers team in the comic books from the (mostly reliable) Marvel Wikia to see how the composition of the team has changed over time. Not counting the Dark, New Dark or Astonishing Avengers, because those guys are bad guys and aren’t recognized as Avengers by the main group. This chart also does not include students from the Avengers Academy books. I didn’t have reliable dates for when those characters joined the Avengers, and it’s not clear to me if they ever formally joined at all. I figure that just because someone goes to Xavier’s School for Gifted Youngsters/Jean Grey School for Higher Learning doesn’t make them a member of the X-Men, so to play it safe I excluded them. This also kind of throws into doubt the actual exclusivity of the Avengers. In the books I’ve read, the reaction to being invited to join the team is usually somewhere between “Golly!” and “Me? An Avenger? !” but the team isn’t super strict when it comes to membership.